Whoever wrote that is overlooking the meaning in this movement. I want to point out that those bongo drums should be heard. Everyone should be heard. That’s what the 99% is about. It’s not about 10% being heard. It’s not about 80%. It’s about everyone’s opinion counting. And that’s why I dislike most leaders and representatives. Neither role allows EVERYONE in the community’s voice to be accounted for. They are middlemen, or controllers of the people. Representatives ensure everyone’s voice will NOT be heard because even ideally speaking, a representative votes the way the majority of their constituents want them to. That means the minority is unheard. Direct democracy is the way to have everyone’s voices heard. With leaders, the danger and the likelihood is that they will dominate and control the people and be corrupt. That’s why I find these roles intolerable, especially in terms of this movement which focuses on the 99% being HEARD. I am glad the Occupy movements have not strayed into leaders and dogma and policies and all that other crap that holds us back from being an equal and fair and accurate society. I hope this movement will lead to change for the better on this issue and many more in our global community. So please let whoever wants to play bongo drums continue, and listen to every last person. A single voice discounted makes this an unfair community. We need change, and for it to be satisfactory it’ll have to satisfy everyone. P.S. The only leader I can think of offhand that I did like is Dr. Martin Luther King, Jr. His civil rights movement seems similar to me and he did not hinder it, rather he strongly encouraged it. 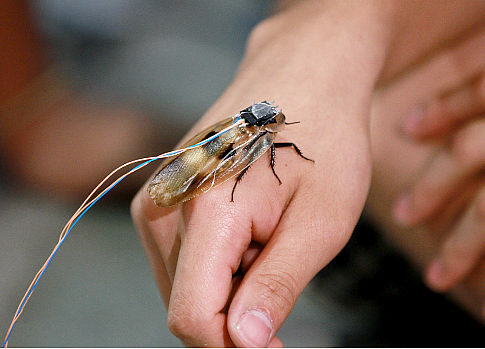 Yesterday (8/10/2011) the free newspaper “metro” printed a story entitled, “Science experiment: Dancing robo-roaches”. I don’t want to scare you off with antagonism right off the bat but I can’t help it I fear. This is not a funny title. This is not funny. This shouldn’t be meant to be funny. I don’t care that titles are supposed to be “catchy”. This is disrespectful. Yes I know they are cockroaches. However I believe that all creatures are equal. And I believe that if there are any natural rights, everything and everyone has the right to respect, much less consideration!!! So. The article continues with the subtitle: “Cooper Union students control hated pests with pop music. But PETA says it’s just plain critter cruelty.” Can you even say or read those two sentences side by side without realizing the grossness of the situation? “CONTROL”, “HATED PESTS”, with “POP MUSIC”. Sigh. 😦 So disrespectful. So, “four New York City high school students spent their summer experimenting with roaches at Cooper Union, teaching New York’s most hated insect to “dance” to popular music.” Real scientific goal there. The leader of the experiment, “said he hopes it can one day help develop neuroprosthetics…”. He “hopes”? “One day”? Really? Is there any clear-cut plan that they are moving along to reach that which necessitates these experiments? If there is, it hasn’t been mentioned in any of the articles I have read about this. And even if they had a solid scientific goal, I would protest this animal abuse. And I will further point out that it is not dancing, it is being manipulated into idiotically jerking about because it is being fed electric currents by children who confuse it’s perceptions into responding to fake stimuli. Personally, I have not chosen a religion and I am unsure about many things in life. But if I believe in anything, I believe that we are all equal. That we all deserve respect. And that violence towards anyone-be it creature, human, earth- is wrong. I do believe those things. And if there are universal truths I think they would be among them. How can we stop violence? It’s appalling that it’s going on so much everywhere! When I was younger I would hear scary stories on the news and my mother would comfort me and tell me not to watch the news because it disturbed me, and I tried not to. I thought the news was a bad thing. And I comforted myself by thinking that it wouldn’t happen to me, bad things didn’t happen in my part of the world. Girls are mutilated in Africa, women are kidnapped and turned to slaves in Europe, women in Asia are sold into slavery by their family, insane people stalk random innocents and carry out grisly murders, people take out frustration on innocent peaceful animals and we hack away at the earth, destroying our home. But it was too much for me as a child, I was scared, I crawled into the comfort of my bed and my novels, my warm home with my strong mother and sister, in our fortress of life, preserving our interests and safety. Recently I realized that it REALLY does happen in my part of the world. A young boy was kidnapped and murdered in Brooklyn a week ago. The same week, my former high school teacher committed suicide. Neighbors call out to me whenever I don’t wear a sweater, or the sun has gone down. Why aren’t we safe? Why isn’t this a priority? Why in the hell is it so important to the government that they change the rules so that they can keep using money that they don’t have instead of owning up to the financial situation this country is actually in. I don’t think money should be spent on war! Or on half of the things it’s spent on! The way I see it, the government is here because we want it to be and it is meant to enforce a set of rules we agree on. One of the most important being: no violence. I CAN’T STAND IT that three times in the past few weeks when walking in different stores I’ve heard adults yell at their children that they were going to “get hit” or “beat” for their behavior. This shouldn’t be permissable. They should be damn scared to mutter something like that in public. And we should find a way to prevent violence inside homes as well. Just because you are in “your house” doesn’t mean there are different rules for society or behavior or basic human rights in that particular location. It’s still wrong and illegal and it needs to be prevented. Of all the things that need to be fixed, we need to stop hurting each other in order to talk about any other problems. Violence among people, or of people on creatures and the environment, must be put a stop to. Isn’t it the most important thing to be eliminated first in order to have any kind of a functioning society? SAFETY. If anyone has any thoughts, advice, or ideas or opportunities that they can share on this issue, please do. It has often been said, “do unto others as you would have them do unto you”. (And not only by religious people!) This is a sound piece of advice, because it encourages forethought in our actions that will most likely prevent negativity when well done. Now I guess it would be silly to assume, but I did think, well, then I’ll be treated nicely in return! However, like most assumptions that is a silly ideal way of thinking. Nonetheless, I just realized this morning that it is not to be expected. (Expectations are often the opposite of useful). But once you take away that reward and nicety at the end of the exercise, what are you left with. A half-second later I realized, you do it anyway. You treat people how you would like to be treated regardless of how they treat you. Because that is what keeps you positive. Following one’s own moral code/conscience is extremely important and very rewarding in itself! It is different from the pleasant feelings that arise from feeling well-treated and appreciated. But even more important! It makes your self-esteem. In addition, I’ve noticed NOT having self-esteem decreases what you can take away from being treated positively-and many others have believed so as well, psychologists, etc.! Also, feeling purposeful and confident generates from following one’s own conscience. So, I will work on doing so. On treating people the way I believe that I and all people ought to be treated ideally. Perhaps karma will pay off in some abstract way-but I won’t expect it. And more likely, I will feel good about myself and feel that I am doing the right thing-very important! A lot of my experiences agree with these observations. For some reason, post-high school a few things changed about me. Firstly, I increasingly was more vocal, assertive and firm about my opinions. Not in the arguing way, in the I-stand-my-ground-am-not-just-part-of-a-flock way. There is a sort of crowd mentality that can easily develop and take away from a person’s individuality and I think it affected me a lot while in my big high school! Secondly, I increasingly spent time with the people I really enjoyed being with and felt positive around-and decreasingly spent time with the people I often felt negative around! These things helped me be more myself and more happy and they are inextricably linked! So I’m sure that continuing to be true to myself by trying to treat everyone ideally will further increase positivity in my life-and probably others’ lives as well! Happy holidays! And if this isn’t one of your holidays, well, have a great day! 🙂 Any thoughts? What makes someone the person they are? I have often wondered what makes someone who they are. We are often told of nature and nurture. Nature being the genetics you were born with and nurture being the environment you grow up in. Lately I’ve thought perhaps there is a third aspect, that of mindfulness. Mindfulness is choosing to do things, consciously. It overrides other things such as emotion, because it is logical. It’s objective you might say. A possible example is I want to have a candy bar. Nature– I shouldn’t because it will be bad for my health. Nurture– I shouldn’t because I will feel guilty, regretful and get disapproval. Mindfulness– I shouldn’t because the bad consequences outweigh the good for me. It is a decision based on logic rather than emotion and impulsion. This may seem a slight change, but it can make a great deal of difference. Living with mindfulness can create more strength in your personal morality and increase the success of following it in your actions, leading to positivity in many ways. This theory of mindfulness being a third vital part in an person’s development or personality or identity, however you’d like to describe it, also answers other questions. I’ve often heard of someone acting a certain way and their actions being attributed to their nature or nurture. Genes or environment. And sometimes people even say that justifies negative actions. But then almost immediately comes to my mind, that there are often instances of people raised in negative environments, with relatives who have negative traits, being wonderful people. “Overcoming” their misfortune, or simply being a wonderful radiant human being despite their negative surroundings and difficult life. These people don’t even have to be exceptionally positive. There are people raised in negative environments, with negative genealogy that are simply positive. They are different from their nature and nurture components. There is something else that is behind this occurrence. What could be the reason? Mindfulness. It transcends nature and nurture. Mindfulness is empowering. Mindfulness is the individual having a moral code and consciously striving for it. The individual consciousness of each person is the difference. Some might call it “soul”. It is independent of and superior to nature and nurture. Therefore it is more than integral to every individual. I think this can help in understanding people. For instance, obviously people will disagree at times, we all seem to have a different morality, as we have different individual consciousnesses. Perhaps disagreements and the separation and isolation of people may be overcome with compromise, understanding and unity. In any case, to communicate and act effectively, it is important to remember anyone you interact with is different from you. For these and other reasons, I often think people may have a reason for their actions, but not an excuse. As in a reason being a driving force, a cause, etc. And an excuse being something that makes the action excusable. Anyway, how could we have an excuse for anything? We will never know everything. We ourselves are in a constant state of flux-including our morality, it develops with every second and experience-and so is the rest of the universe. Hindsight constantly makes things clearer, but that only tells me how much more there is to learn and know, which is great and scary. Well at least I seem to more clearly comprehend one of the infinite amount of riddles to contemplate. Hope this may be of service to anyone. Feel free to give feedback if you wish. Peace. When did the government become a monster? This is the first post about a topic I often think of and may return to here. The not ideal state of the U.S.A.’s entire government system. More and more I’ve thought that our government is a monster. I wonder when it became one. Was it as soon as they started creating it, when it grew to a certain size? Or was it recently when the distance between representative and “ordinary citizen” grew and the relationship of the thing became skewed? When do our representatives really listen to us? And why are there so many? Why can’t we have a direct democracy and make all decisions by majority or unanimous vote of the ACTUAL public? The way it is now, I see the government as a monster. It is humongous, far beyond the proportions that it should be. It overreaches so many boundaries. It regulates our very civil liberties. It presumes to tell us what is correct behavior for our own health (sin taxes, illegalization of substances, limits). Yes cigarettes are bad for you. And yes overly sugary drinks are bad for you. And yes alcohol is bad for you. But who gave the government the right to regulate these things, specially tax these things, declare them illegal and spend money-probably ours-and time advertising against these things, in our delis and on our trains? I certainly didn’t give them that right. I never said I thought that was their job. Because I don’t think it is. Did you give them that right? If I didn’t give them that right and you probably didn’t either, do they have that right at all? What do we really see when we look at someone? This is my first real post on wordpress. It seems a bit long, but give it a read if you’d like. I hope you find it interesting, world. Today I was walking in Manhattan; it was a wet, chilly day, garbage on the floor, advertisements at eye-level. Advertisements with models caught my eye, and I recalled an idea that I think about from time to time. The idea that we often make opinions on people based on their physical appearance. We do it with strangers, with first impressions, even with people we know well. We analyze their body, their clothes, their hair, their makeup, their features, their skin, their footwear, their posture. Sometimes we do this consciously and sometimes the adaptive unconscious does it for us. We often subconsciously sum people up, based on a combination of a million different little things that we notice about them, that make us feel a certain way about them, all in the space of a few seconds. And I wonder, is it inaccurate to judge people on appearance? Is it misleading to think a certain way about someone because of their physical attributes, because of their closeness to societys-or our individual-idea of being attractive? And I wonder, why do people approach strangers when they think they are attractive? What does their physical appearance have to do with whether or not you will have anything in common or be compatible in any way? It seems like total foolishness. You fit my description of attractiveness, and so I approach you. Is that not very shallow? Is that not random and unusual? I often have these thoughts, and today I had a new one, continuing on this idea. I recently read a book called “The Mastery of Love” by Don Miguel Ruiz. In this book, there was a part that discussed everyones search for what makes up their identity. What am I? Am I my body? Am I my mind? Am I my heart or my soul? The book says that we are not any of those things. We are a force. We are a force passing through this body that we occupy. That is what all people and living things are. (Personally, I expand this to include inanimate things, because they are made of energy! Everything is made of energy. And what is now a rock or the table we rest our hand on, may become part of a person’s fingernail or the bark of a tree or the fluff of a plants seed in time. Our body is inanimate anyway, without our force occupying it, and it is still energy, particles, force). In any case, remembering the thought that what we ARE is a force, I thought perhaps we find people attractive, because of who they really are-a combination of the physical and the force. Because if you think about it, the force in everyone shines through their body. It comes out in the glint or the dullness in their eyes. It’s expressed with all of their movements, gestures and expressions. So perhaps it’s not totally shallow, perhaps we do see more to a person, when we see their physical body. At least we can say that for when you see somebody in person, or perhaps in a movie or commercial. And one might go even futher to say that it is true of pictures, stills, as well. A picture of someone can almost catch the essence, the force, being expressed through their physical body. And as I thought these things, I thought, this must most certainly be true. We are not attracted to solely the physical. If we were, we would find corpses, mannequins and masks attractive. But as it is, most people do not. Most people find that thought revolting. Additionally, we find revolting the person whose force repels us. The person whose movements, words, expressions and morality disagree with us as individuals, no matter how “attractive” they may be considered by others. And the reverse is true as well, we often find people attractive that are not necessarily thought of as so by society. Because it’s not just about legs or eyes or height, it really isn’t the physical observation that we make the judgment on. So while it comes into play, I think the truth is that physical attributes are not the sole thing your opinion of others is based on when you analyze their looks-whether you realize it or not. Thought for the day.